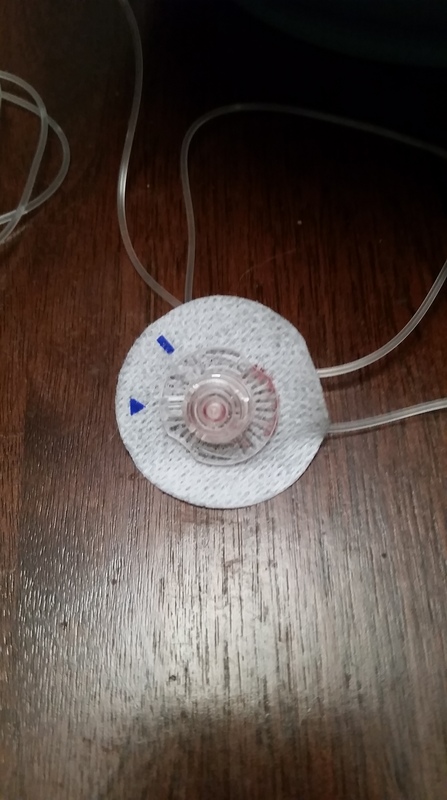 This is the most recent infusion set I used to pump insulin into my body. You know, the thing I need to do 24 hours a day, every day, or else I die. When you inject insulin, either by syringe or by insulin pump, you run the risk of drawing some blood out at the same time. It’s just part of the landscape. You learn to live with the possibility of blood coming out while you’re trying to get insulin into your body. If you’ve never lived with diabetes… imagine pulling an infusion set from your body and small (and sometimes, large) amounts of blood comes from the site. 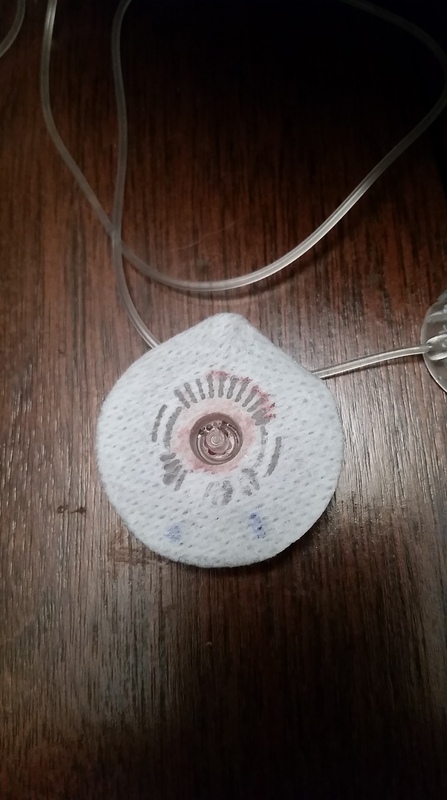 Imagine having to pull a set early because you can see that blood is on the outer portion of the adhesive used to hold the cannula (the small plastic tube that winds up inside your body, through which insulin is pumped) in place. Then imagine the idea that this will happen many times if you’re lucky enough to live many years with this condition. 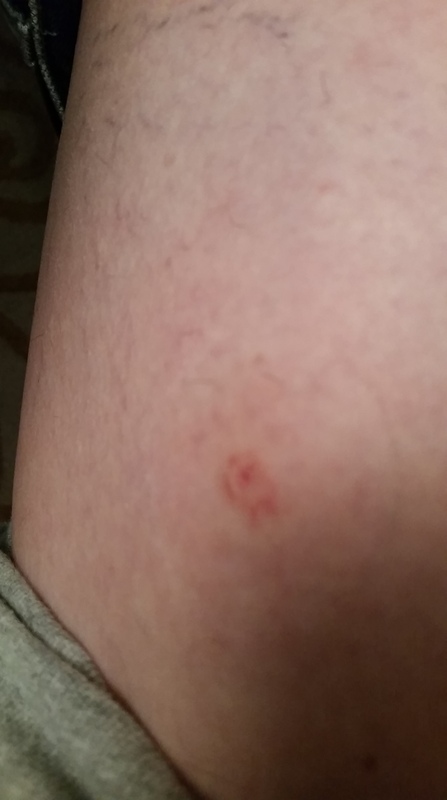 This is the site on my leg where that infusion set was placed. I took this photo within five minutes after pulling the set. My leg will look like this for a couple of days, at least. 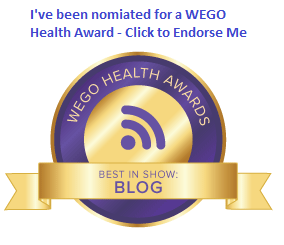 I need to be careful not to use that site again for as long as I can, because the scarring that has gone on under the skin could keep me from being able to pump insulin through that spot for some time. If I overuse that site, repeated scarring could make it impossible to pump insulin through there permanently. If you’ve never lived with diabetes… imagine looking at a site like that after three days (or less). Imagine knowing you’ll have another site just like it to look at in three more days (or less). Do the math and imagine how many of these wounds you’d willingly give yourself over the years just to keep from dying. 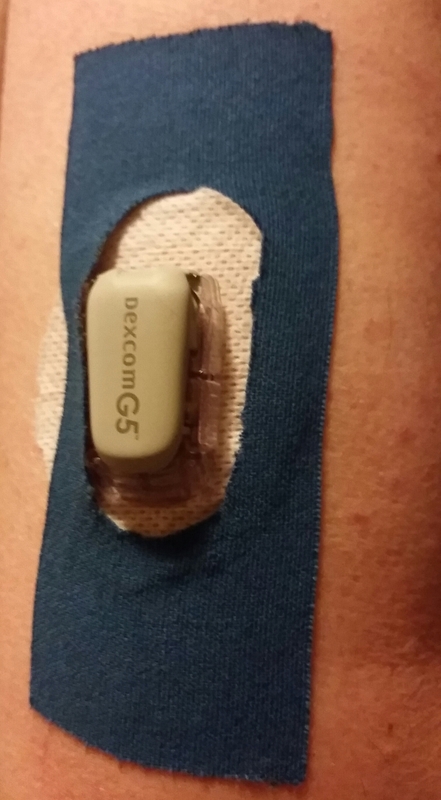 This is my Dexcom sensor site after two weeks. The sensor sits under the skin and measures glucose in the interstitial fluid between your skin and your blood vessels. After about a week or so, the adhesive around the sensor starts to pull away from the skin. To continue to hold the sensor in place, I add something called KT tape. It’s the tape you see beach volleyball players wear. It’s flexible and stays in place and is fairly water resistant. Using the tape allows me to get an extra week or two worth of wear from a sensor. Sensors are expensive, and they’re just one of the many things we’re required to purchase if we want to manage our diabetes as well as possible. If you’ve never lived with diabetes… imagine getting out the tape every couple of weeks and carefully cutting a hole (hopefully better than the one above) and even more carefully placing the tape over the sensor, placing it so it will hold the sensor and surrounding adhesive in place for a little while longer, so you can afford to purchase something else you really need. The crazy thing about all of this is that I’m one of the lucky ones living with this disease. I actually have access to an insulin pump and supplies, a continuous glucose monitor, and other tools of diabetes management. But I’ll never outlive the scars. I’ll never get a chance to rest. There will always be one more thing that needs attention. Every day of my life. It is never ending. « Join the Champion Athletes With Diabetes this Year! I totally GET IT!!!! Sorry ur leg is messed up from the last infusion site! !Thanks for reminding the world (or at least those reading-our little corner of the world) what it is like to be one of the “lucky” ones living w D. HUGS!!! Mine as well Stephen. Fortunately this life beats the alternative.